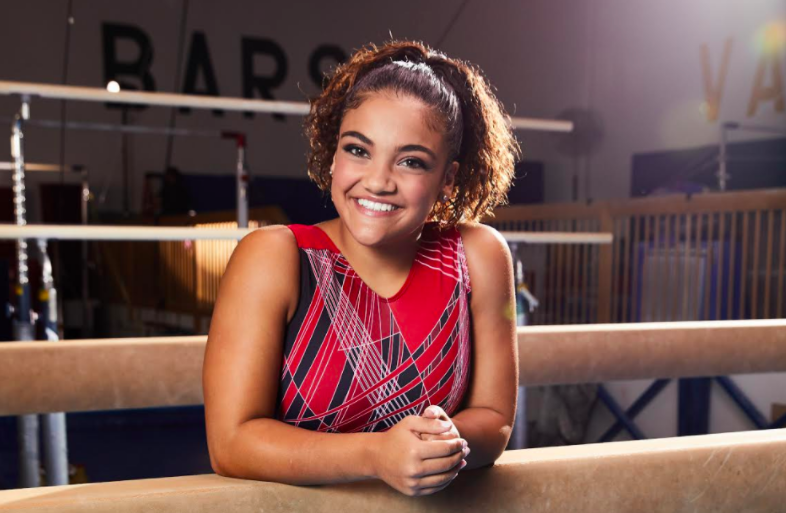 Olympic Gymnast Laurie Hernandez Talks About Her Hispanic Heritage, Partnership and More! When it comes to the Olympics,Laurie Hernandez is a name that immediately comes to mind, especially surrounding the conversation of gymnastics. However, this young Latina is famous for more than her fabulous balance beam routines, she was the winner of the 23rd season of Dancing With The Stars, has written a book and now has a new partnership with Alcon DAILIES® contact lenses. We were able to catch up with this very busy and talented gold-medalist and learn more about her partnership, advice for young aspiring athletes and some of the highlights of her already successful career. I was an energetic child, always walking on my hands, flipping off of the back of the couch or jumping up and down on my bed. One day at the age of five, I was watching television and saw Shawn Johnson and Nastia Liukin doing flips. I turned to my Mom and said, “I want to do gymnastics, and I want to go to the Olympics just like them.” My mom enrolled me into a recreational class, and from then on I loved the sport and never looked back. How has your Hispanic heritage impacted your gymnastics career? I think being able to be a Hispanic gymnast—I definitely take it as a big responsibility to be a role model for all the younger girls that were watching last year. Having the opportunity to go to the U.S. Olympics was great because I was the first Latina in over 30 years to compete in gymnastics at the Olympics. So I’ve noticed, from being able to do that, I’ve had a lot of Hispanic families come up to me and say things like; ‘you know my daughter never thought she could try something new, but after seeing you she wants to start gymnastics,’ you know just a lot of different sweet stories from different people. So I think that definitely the biggest impact I’ve been able to have and I hope that I’ll make much more. What is your advice for young athletes and Latina’s who look up to you and are in the pursuit of their own careers? My advice to them would be just doing what you love. Being able to do what you love and do things that you’re passionate about. Just don’t forget to help other people, if you get to do the things that you love, don’t forget the people around you. What do you do for fun when you’re not training? What’s something about you that would surprise your fans? When I’m not training I’m am typically doing anything self-care so like bath bombs and face masks, or like having a movie night with my family, if that’s possible. Something that would probably surprise my fans is that I wear contact lenses and nobody really knows that because I guess I’ve never really had to tell anybody about that. So yeah, I wear contact lenses and it definitely helps me in gymnastics. So tell us a little bit more about your partnership, and how wearing contacts has helped you in gymnastics. Yeah, absolutely. So I’m partnered with Alcon DAILIES® and my mom had actually taken me to the eye doctor to get my eyes checked out, you know it’s important to make sure health wise you’re always okay and my vision wasn’t the greatest so my doctor recommended Alcon DAILIES®. Ever since then I’ve been using these and it’s definitely helped me, I’ve never had to worry about being able to see at all. I’ve just been able to worry about the skills I’m doing, which is definitely helpful, especially as a gymnast. What has the best part of your gymnastics career been? What are some of the hardships? I think some of the highlights would definitely be the Olympics and dancing with the stars and then being able to publish a book right after, those would be some of the highlights of my life really. I think a hardship would be a lot of the injuries that I had to take care of in the process; I’ve had to get surgeries, but I’ve also been able to come back stronger than ever. I think that it’s important to make sure that health wise you’re okay. Can you speak a little bit about your experience on Dancing With The Stars? Oh my goodness, Dancing With The Stars was so much fun! It was definitely unlike anything I’ve ever done before and if I had the opportunity to do it again I absolutely would, but I think being able to learn so many new dances and being able to meet so many different people. I wish I could just go back there, it went by so fast. Was it difficult for you to transition from being a gymnast to learning the technique of a dancer? A lot of people think being able to do gymnastics and have floor routines dancing would be super easy, but I think they are in completely different categories. When it comes to dancing you are like doing the floor exercises and you’re showing off your tumbling, leaps, and jumps, but for Dancing with the stars you’re actually showcasing your dancing so it has to be perfect. So it was definitely a little intimidating going into it, because I had never had any dance lessons before, but I had a great experience. You’ve already done so much at such a young age, but what are your hopes and dreams for the future? What’s next? I think the biggest thing would be finishing up my last year of high school, that’s definitely something I am looking forward to. Hopefully, a drivers license [Laughs]. That would be nice too, I hope I get that. Is it hard to balance being a student with being an athlete? Yeah I mean it’s definitely difficult just because both are such big priorities in my life right now and so it’s important to make time for both of them. I think also being homeschooled at such a young age, helped me to make sure I had my priorities set and ensured that I made time for school and also time for practice. Yeah, just making sure that you’re taking care of yourself while doing the things you love whether it’s a sport or it’s education, just making sure that you’re okay and that you are getting your whole body checked out and if there is something wrong making sure that you are getting your eyes checked, who knows maybe you’ll need contacts. It’s more about just making sure I make the time for it. I know a lot of times we’ll say ‘oh my gosh, I’m so busy,’ but the reality is we are able to move things over especially when it comes to health. So just making sure that you and your body come first.